Braids using my own hair. I Am So Blessed, nicki6, imaginary and 18 others like this. NewYorkgyrl, I Am So Blessed, nicki6 and 17 others like this. Crochet Braids in a loose braid out. It will expand over the week. nicki6, imaginary, flyygirlll2 and 5 others like this. Here's the tutorial for any who are interested on the twisted bun, I posted earlier. SAPNK, ilong, flyygirlll2 and 13 others like this. I've been meaning to post but I have had these in for about 3 weeks. Individual crotchet locs around the perimeter and traditional crochet locs in the back. I loved it, also loved wearing them with nothing on my edges for that more 'natural' look. I wouldn't suggest this hairstyle if your hair is long because I had to trim about an 1nch off because my hair was longer than the loc #notcomplaingthough. Also nothing like having actual loc'ed sisters compliment your faux locs. flyygirlll2, kxlot79, naturalagain2 and 6 others like this. So yall know I had to drop this little tutorial for any who are interested. nicki6, flyygirlll2, UmSumayyah and 6 others like this. Been wearing these for the last week (there is one on each side). I re-do them every day without combing or anything. Working on rebraiding only every other day, then more. nicki6, imaginary, Learn2Gro and 5 others like this. I have been protective styling with three strand twists. 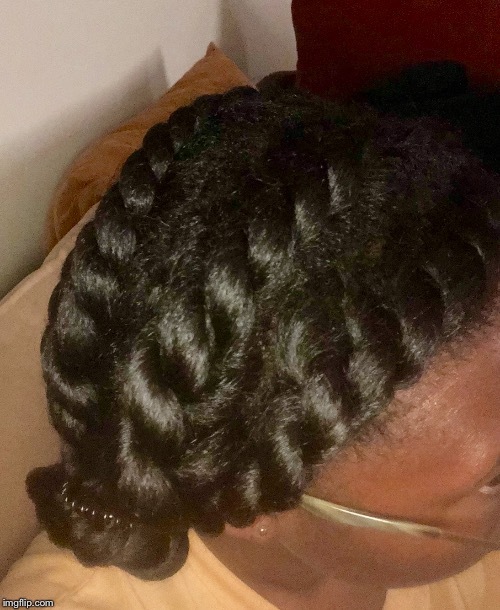 I had previously tried teo strand twists but they kept coming out. This method works better. I am going to make them smaller next time. imaginary, neika j, shawnyblazes and 3 others like this. Did some twists on stretched hair. I Am So Blessed, nicki6, Garner and 34 others like this. Box braids for the win. UmSumayyah, CocoGlow, flyygirlll2 and 4 others like this. blazingbeauty, faithVA, Pygmy_puff and 2 others like this. snoop, MzSwift, imaginary and 3 others like this. Some of my three strand twists unravel. I have done a little research and it seems that some people use bobbypins to secure the ends until their hair dries. Does anyone do this? Can you upload a picture? I am mot understanding what I am doing wrong. That is cute. And that's a nice example with you doing it with your twists. Garner, blazingbeauty, imaginary and 10 others like this. Maybe you are making them too big? I know that if I do only a couple big braids or twists on my hair they tend to unravel as they dry. If I do at least 6 twists on my head they usually will stay twisted ok. I worry that if you put Bobby pins at the end it might ruin the little spiral curl at the end of the hair. Idk. I hope you find a solution that works for you! Three strand twist outs are so pretty. CocoGlow, Realhairdontcare and faithVA like this. You may not be doing anything wrong. Everyone has different hair. What product(s) are you using to twist with? Is your hair in it's natural state or are you twisting on stretched hair? Do you twirl the ends of your twist around your fingers? Instead of bobby pins you can try putting your twist on small perm rods if you have them. CocoGlow, Pygmy_puff and Dominga11 like this. I am using shea butter and Aunt Jackie's No Shrink Gel on damp hair. My sister came over today and she agrees with you that a couple of patches of my hair are a different texture and that is accounting for the difference. This is also probably the reason why my wash and gos vary in results. I am going to just two strand twist those sections and retwist daily if needed. If this proves to be too much manipulation, I'll have to come up with a different protective style. faithVA, CocoGlow, Chicoro and 1 other person like this. I straightened my hair for the first weekend of 2019. Finally had the confidence to get my hair back to one length once and for all and I think I got rid of all of my unnatural layers. Back to BSL and I feel basically ******** So as soon as my hair is curly, I’m hitting the growth challenges with a vengeance. I want WL Dec 2019!!! And this is my first protective style of the year... cause I’m trying to get my straight-ish hair to last through a few weekends. This is 5 flat twists at a slant going back. I will be keeping these in til Saturday and hopefully rocking some nice beachy waves when I take them out. nicki6, SuchaLady, shawnyblazes and 9 others like this. Looks like silk, black strands! Look at the health and shine of this gorgeous hair!!!! MzSwift, flyygirlll2, grownwomanaz and 2 others like this. blazingbeauty, flyygirlll2 and faithVA like this. Still living in my buns. I Am So Blessed, Miss_Luna, AmethystLily and 17 others like this. Wowww-ie! That sure is a pretty updo! Is that a “puff cuff” you are using? I’m in love with this look! It looks so elegant especially paired with the earrings. Work it girl!! ilong, Chicoro, flyygirlll2 and 2 others like this. Thank you . Yes, it’s a puff cuff. I really like it since it’s not tight on my head at all. Makes styling so much easier. snoop, shawnyblazes, faithVA and 2 others like this. faithVA and NowIAmNappy like this. I Am So Blessed, nicki6, Loving and 13 others like this. @Alta Angel Love it! I enjoy wearing these type of buns. shawnyblazes, faithVA and Alta Angel like this. That bun is SUPER GORGEOUS!!!!!!!!!! Please tell how you created it! That's the same lovely style @flyygirlll2 has! Somebody needs to teach me how to do this, please. Is this the same bun as in post #754, with the video tutorial by @NowIAmNappy ? LonDone, I Am So Blessed and faithVA like this. Yes, we are all using variations of the same bun! I moisturize my hair and put on an elastic headband. I put my hair in 6 twists and put an extra dollop of leave-in conditioner on my ends. I take the twists by the ends and then use a bobby pin to pin all the ends together and to the back of my head. That's it! That bun is SUPER GORGEOUS!!!!!!!!!! Please tell how you created! Is the same bun as in post #754, with the video tutorial by @NowIAmNappy ? Chicoro and faithVA like this.